(Bloomberg) -- Watching Tiger Woods winning the Masters again can tell one thing: comebacks are possible. 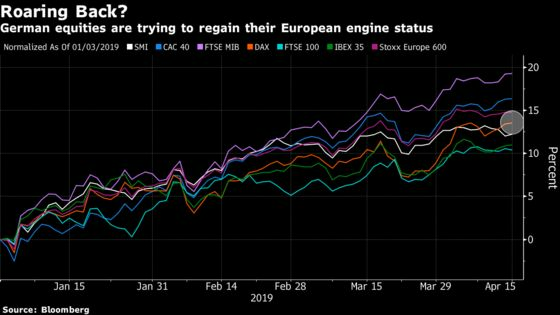 The Stoxx Europe 600 is still a few percent away from its 2018 highs. It’s a decent performance, especially judging by an economic outlook that is not getting any brighter. 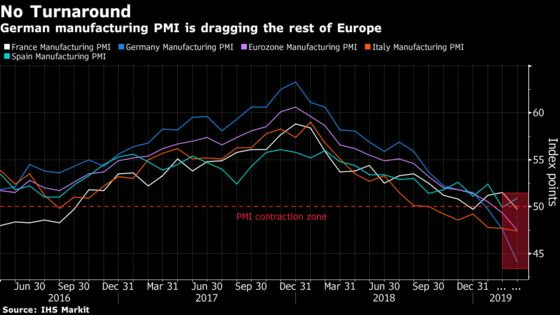 Capping off some dismal manufacturing indicators this year, the German government is likely to halve its growth expectation from 1% to 0.5% tomorrow, according to a Der Spiegel report last week. Investors are likely to not care, already eyeing better times. Judging from the recent rebound in relevant stocks, the market has maneuvered for something better. While expectations into the earnings season remain rather low, the relative rate of earnings downgrades has slowed in recent months, and a weaker euro is providing exporters with some leeway. 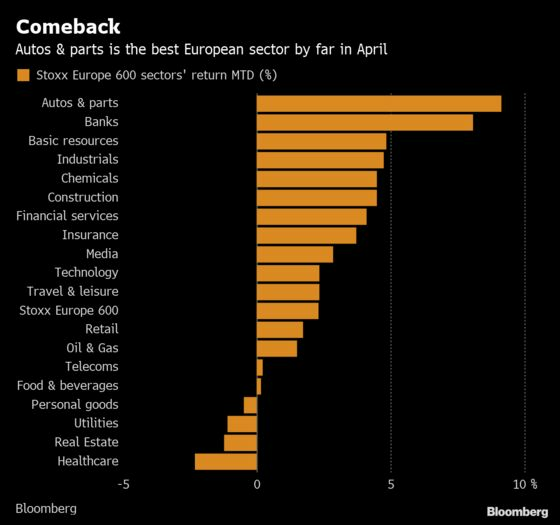 Autos have staged a nice comeback in April, and that’s playing positively for the DAX. German Economy Minister Peter Altmaier’s Wednesday press briefing should bring one of the last institutions in line with the consensus, which has already firmly reduced its growth expectation for Europe’s biggest economy. The German stock market is not the hottest place to be, especially when you look at the DAX without dividends. 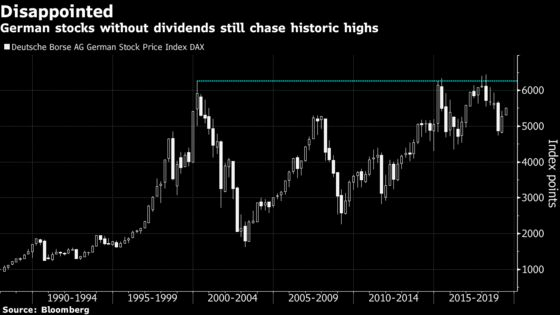 That said, they are still chasing historic highs and analysts at UBS recently voiced a bullish stance on German stocks, noting in a publication earlier this month that there is progress on some potential catalysts. German equities, heavily skewed to exporters, are moving with the global trade sentiment. Trade talks have softened in recent months and the engagement between the U.S. and China isn’t as hostile as it was before. Improved Chinese macro data has sent some relief signals that help outweigh a still fragile domestic and European data. Last week, Deutsche Bank strategists noted that despite a slump in exports last year, Germany is a beneficiary of China’s efforts to modernize its production facilities under the “Made in China 2025” strategy. That may be part of the reason that while German stocks have underperformed their French and Italian counterparts and are lagging the broader Stoxx 600, they are up a decent 14% this year and doing a lot better than a couple of months ago, both in relative and absolute terms. The gain already matches the forecast of analysts for the full year and momentum seems to slow, so we might be due for a breather now that we are entering earnings season. In the meantime, Euro Stoxx 50 futures are trading up 0.2% ahead of the open. Watch the debut of Europe’s biggest IPO so far this year: Nexi. A flurry of deals have already graced markets in the second quarter and investors also will be girding themselves for another potential float to come in the shape of Nordic buyout house EQT Partners. It could all result in a hangover for investors, but perhaps the cure is fewer unicorns and more unicorn IPOs. Watch trade-sensitive sectors as European negotiators got the green light to get started on trade negotiations with the U.S., with a target of getting something done by September. Meanwhile, the U.S. and China continue to talk, particularly on farm goods. The four biggest economies in the world are now gripped by trade negotiations. Watch for central bank policy impact as Chicago Fed President Charles Evans said he can see the central bank keeping rates where they are until late 2020, while the Fed is also starting to consider its employment mandate. In Europe, the ECB continues to argue that negative rates have been positive. Citi says a rebound in assets under management for Swiss banks will support recurring revenue streams, while concerns on the sector look overdone, raising its rating on Vontobel to buy from neutral. Citi stays overweight Swiss banks with buy ratings on all stocks covered; order of preference is Credit Suisse (also on Citi’s Focus List), EFG International, Vontobel, Julius Baer and UBS. Jefferies writes Barclays corporate and investment banking revenue likely to be slower than anticipated in 2019, albeit with easier comparatives for 2H. 2019 revenue estimates cut by ~4%, pretax profit by 8% on slower investment bank activity, modestly lower margins in U.K. business; similar cuts made for 2020 and new EPS estimates introduced for 2021. Kepps buy and raises PT to 280p from 263p.